Our Leeds studio has 15 classes every week, from Iyengar to Vinyasa, we have the class to suit your needs. Our timetable makes it easy for you to choose a class based around your busy schedule and means you never miss out on your much needed relaxation time. Check our timetable for availability and times. And, enquire about joining David Lloyd Leeds, here. These sessions concentrate on bringing balance and harmony to both body and mind, through postures and breath. They can help to boost the immune system, encourage relaxation and correct posture alignment. We hold two general yoga classes a week. Hot Yoga takes place in our heated studio, helping to provide a deeper muscular workout, aid with poses and increase intensity where required. This session can help to boost the immune system, encourage relaxation and correct posture alignment. Try one of our three sessions a week. This form of yoga is known for its use of props - including belts, blocks, and blankets - as aids in performing postures and characterised by great attention to detail and precise focus on body alignment. We recommend this class for members that are experienced in Yoga practice. 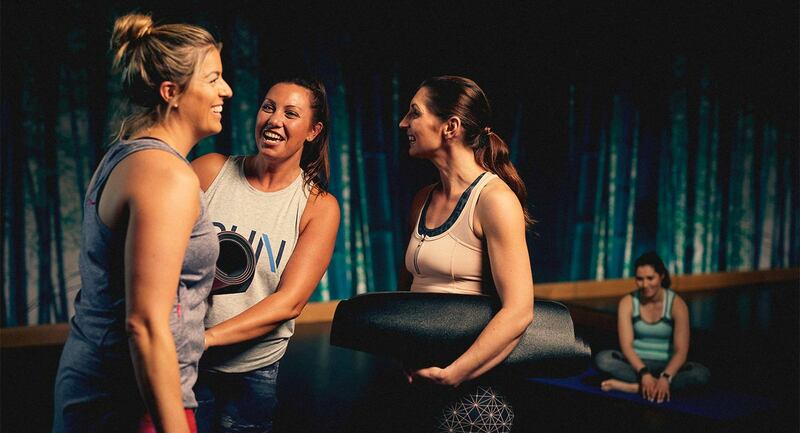 With seven classes a week, you’ll be able to find time to fit around your busy schedule. Vinyasa yoga is not only meditative but also physically challenging. Correct breath control is focused on, to create a seamless flow of postures. Try one class a week. A yoga class with eight components: morality; ethics; posture; breath control; sense control; concentration; meditation and absorption. An intense yoga workout. With two classes a week you can find the time to fit around your busy schedule. Yoga is gentle in nature and for that reason is open to anyone. Whether you are a beginner or master anyone can attend. We also take pregnant women in our classes as it is a great way to de-stress, although we advise you ask your doctor first. Our classes are led by experienced Yoga instructors who will guide you through every bend and stretch. They are able to adapt the sequence for every ability so beginners can mix with even the most experienced yogis.